Actually, the Electoral College Was a Pro-Slavery Ploy. Many Americans are critical of the Electoral College, an attitude that seems to have intensified since Donald Trump defeated Hillary Clinton in the 2016 presidential election despite losing the popular vote. These critics often make two arguments: first, that electing the president by direct popular vote would be preferable in a democracy; and second, that the Electoral College has disreputable origins, having been put into the Constitution to protect the institution of slavery. Both sides are misguided. There are legitimate reasons to keep the Electoral College system, odd and creaky though it may be, but we must accept the fact that it does have deep roots in efforts by the founders to accommodate slavery. The Electoral College was not mainly designed to balance big states against small states. It certainly did not have that effect: Eight of the first nine presidential elections were won by candidates who were plantation owners from Virginia, then America's biggest state. Only three candidates from small states have ever been elected president: Zachary Taylor, Franklin Pierce and Bill Clinton. As James Madison made clear at the Constitutional Convention in 1787 in Philadelphia, the big political divide in America was not between big and small states; it was between North and South and was all about slavery. 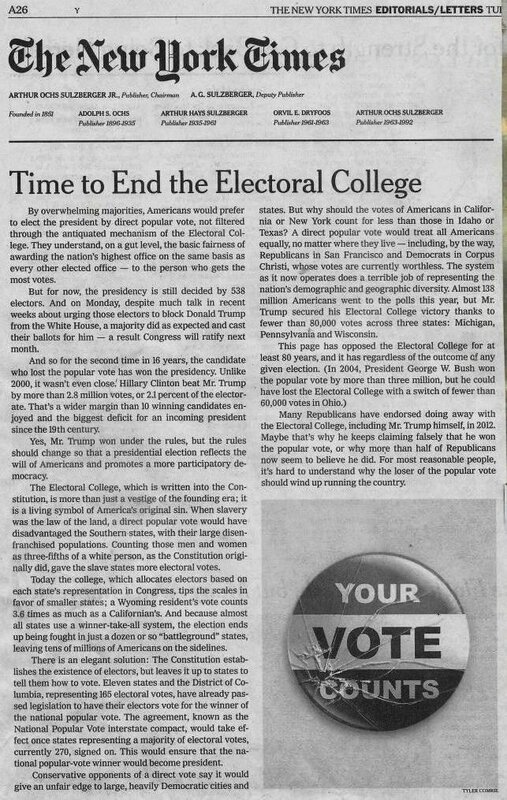 So, too, was the Electoral College at the founding, both in its original incarnation in 1787 and in the version later created by the 12th Amendment, which was adopted in 1804. Behind closed doors at the Constitutional Convention, when the idea of direct presidential election was proposed by the Northerner James Wilson, the Southerner James Madison explained why this was a political nonstarter: Slaves couldn't vote, so the slaveholding South would basically lose every time in a national direct vote. But if slaves could somehow be counted in an indirect system, maybe at a discount (say, three-fifths), well, that might sell in the South. Thus were planted the early seeds of an Electoral College system. Some have argued that direct election was doomed because the Philadelphia delegates disdained democracy. Behind closed doors these elites did indeed bad-mouth the masses (as do elites today). But look at what the framers of the Constitution did, rather than what they said. They put the Constitution itself to a far more democratic vote than had been seen before. They provided for a directly elected House of Representatives (which the earlier Articles of Confederation did not do). They omitted all property qualifications for leading federal positions, unlike almost every state constitution then on the books. So why didn't they go even further, providing direct presidential election? Because of Madison's political calculation: Direct election would have been a dealbreaker for the South. For a while, having members of Congress elect the president emerged as a possible alternative, but this idea, too, would have been pro-slavery for the same reason: Thanks to the three-fifths clause, slave states got extra votes in the House, just as in the Electoral College system that was finally adopted. When George Washington left the political stage in the mid-1790s, America witnessed its first two contested presidential elections. Twice, most Southerners backed a Southerner (Thomas Jefferson) and most Northerners backed a Northerner (John Adams). Without the extra electoral votes generated by its enormous slave population, the South would have lost the election of 1800, which Jefferson won. It is true, as some have noted, that some Northerners manipulated the vote in that election to their advantage, but that does not erase the ugly fact that the South had extra seats in the Electoral College because of its slaves. When the Constitution was amended to modify the Electoral College after 1800, all America had seen the pro-slavery tilt of the system, but Jefferson's Southern allies steamrollered over Northern congressmen who explicitly proposed eliminating the system's pro-slavery bias. As a result, every president until Abraham Lincoln was either a Southerner or a Northerner who was willing (while president) to accommodate the slaveholding South. The dominant political figure in antebellum America was the pro-slavery Andrew Jackson, who in 1829 proposed eliminating electors while retaining pro-slavery apportionment rules rooted in the three-fifths clause — in effect creating a system of pro-slavery electoral-vote counts without the need for electors themselves. Today, of course, slavery no longer skews and stains our system — and maybe the Electoral College system should remain intact. The best argument in its favor is simply inertia: Any reforms might backfire, with unforeseen and adverse consequences. The Electoral College is the devil we know. But we should not kid ourselves: This devil does indeed have devilish origins. Akhil Reed Amar is a professor at Yale Law School. He wrote this in The New York Times on April 6, 2019. Voices4america Post Script. Twice in recent years the winner of the Popular Vote has not been our President. This needs to stop. Share the hideous origins of the Electoral College! Then let’s end it!